How do I use inline comments and highlighters? Use inline comments and highlighters to give feedback on specific lines of text. Wet Ink allows you to select text in a writing response and comment or highlight just that selected text -- much like you could do on a written manuscript. Other people can also add comments in response to your feedback or create new comments of their own. To leave an inline comment or highlighter, you need to navigate to the response you want to read. An easy way to do this is to go to the "Assignments" tab, and select the response you want to read. You can also find new responses in your Class News feed or under an Assignment within a Lesson. 1. Select the text you'd like to comment on. 2.Click the pop-up box that says "Comment." 2. Write your text in the box. 3. Click the blue "Comment Inline." 2. Choose your highlighter. (These are created by your instructor). 1. 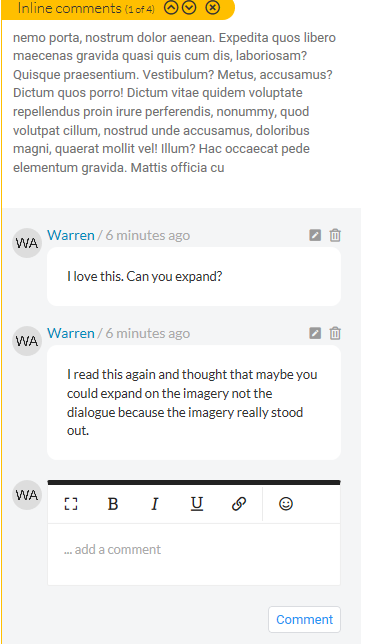 Hover over the text with an inline comment to see the comment. Click on the comment if you wish to comment further. Please note: If you're in Inline comments mode, you can already see all the comments. 3. Click the "Comment" button. To get to this view, click next to the paper clip icon on the text that says "Read # of inline comments." 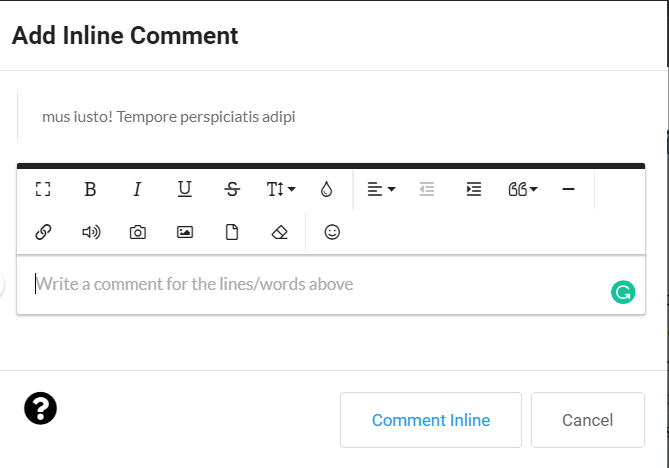 Inline Comments Mode lets you view the inline comments in a wider view. Instead of being on the side of the text, it shows the inline comment across the whole screen. It can be helpful when viewing many comments. In this view you can also view comment from specific class participants by using the drop-down in the upper-left corner.